dance.net - Chantelle Domican Championship Dress 16+, $900 (10241648) - Read article: Ballet, Jazz, Modern, Hip Hop, Tap, Irish, Disco, Twirling, Cheer: Photos, Chat, Games, Jobs, Events! Chantelle Domican dress in black velvet with medium purple sequin overlay on shiny material. Skirt is single panel, bottom ruffles are made of black netting. Underskirt lined in black satin, bodice is also lined. Dress is in great shape and has been carefully cared for. Cape, matching sequin/crystal headband and extra crystals included. Also included is a jeweled number clip for competitions! Asking $900. 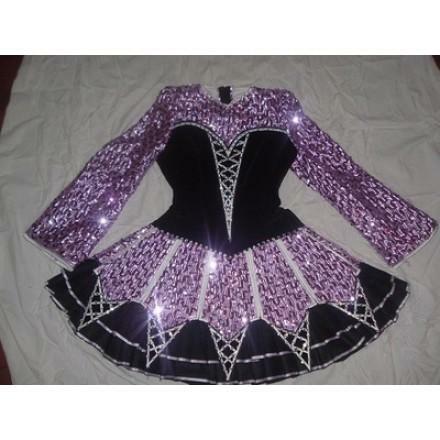 Can bring to a dance school or to a feis in NJ for fitting/sale. Feel free to message me with any questions!